If you see a sunflower plant (Helianthus spp.) in bloom, you'll realize immediately where it gets its name -- from its round, blazing-yellow flower that resembles the sun. Traditionally, sunflowers are extra-tall plants with round, single-petaled flowers, but modern varieties come in many sizes with highly varied flowers. A simple-to-grow plant, the sunflower can fit in most home gardens, needing only bright light and a bit of care now and then to flourish. The common sunflower (Helianthus annuus) originated in North America and is grown today as an annual throughout the United States. American Indians cultivated it thousands of years ago in what is now the U.S. Southwest, grinding the plant's seeds to make flour. Some parts of the plant were used in traditional medicine while others were used to dye clothing and for body painting. Renowned for their large yellow flowers with a central dark disk where seeds develop, sunflowers became popular in home gardens and as farm plants in the 19th century. Today's sunflowers include hundreds of species, all in the genus Helianthus. Tall varieties stand out in the back of a border or along a fence while shorter types are well-suited to the front of the border or as container-grown patio plants. When left on the plants to form seeds, the flowers attract birds, an added bonus for birdwatchers. Some sunflower varieties grow as annual plants, living only one growing season, and others are herbaceous perennials, dying back each winter and returning in spring. Examples of perennial sunflowers include the swamp sunflower (Helianthus angustifolius), which is hardy in U.S. Department of Agriculture plant hardiness zones 6 through 9. Its 3-inch-wide, yellow flowers open in fall on the plant that ranges from 3 to 6 feet tall. The sawtooth sunflower (Helianthus grosse-serratus) is perennial in USDA zones 4 through 7, becoming 6 to 10 feet tall and blooming in late summer or fall. Annual sunflowers have rough and hairy, simple leaves that are oval or slightly heart-shaped. Their flowers are usually 8 to 12 inches wide and bright yellow, although some, such as the cultivar "Italian White," have white flowers. Short annual types that grow 3 to 5 feet tall include "Teddy Bear" and "Autumn Beauty;" "Russian Giant" is a tall annual, growing about 12 feet in height. All sunflowers grow best in full-sun sites, where they put on their best flower display. The plants usually lean toward the sun when grown in partial shade, and tall varieties may fall down when planted there. 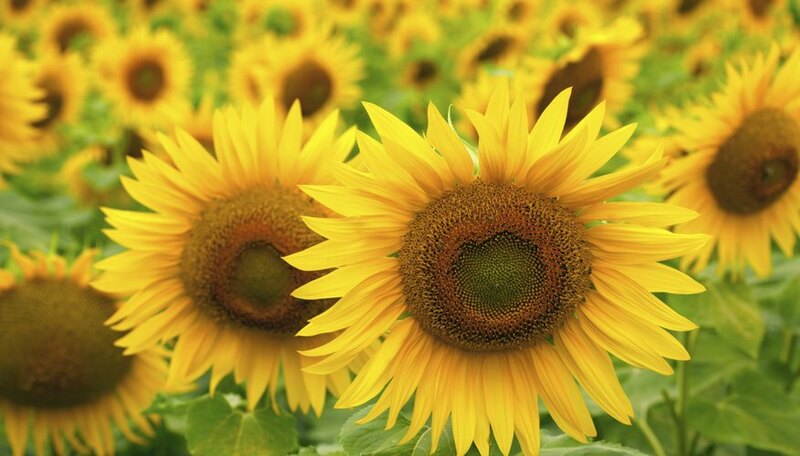 Sunflowers are fast-growing plants, with some flowering and producing seeds only 60 days after being planted. Although they tolerate dry conditions, they grow best when watered whenever the soil's surface is dry to the touch. Adding a few inches of organic mulch around each plant's base helps conserve soil moisture, but keep the mulch several inches from the base to discourage fungal problems. Sunflowers don't require fertilizer, but adding a few inches of compost to their soil at planting time can promote their strong growth. When growing a tall variety, drive a stake into the ground before planting, and after planting use soft ties to attach the stake loosely to the plant's stem to provide support; placing the stake in the ground before planting avoid damaging the plant's roots. Few plants are as problem-free as sunflowers, although they can develop fungal disorders that mottle leaves or fuzzy mold growth in especially wet conditions. Avoid those issues by spacing plants well apart; for example, allow 1 1/2 to 3 feet between annual sunflowers to avoid crowding. When watering, avoid wetting foliage, and water only on sunny days, when water dries quickly. Clear away plant debris on a regular basis to prevent fungal growth in the plants. The sunflower moth, which is small and gray, might lay eggs on the flowers. Wormlike larvae hatch from the eggs and feed on the plants. Remove the larvae by hand. If a larval infestation is severe, then spray the plants with Bacillus thuringiensis, which infects and kills larvae. Dilute Bacillus thuringiensis concentrate at a rate of 2 teaspoons per 1 gallon of water, but check your product's label for directions. Spray until the plants are wet but not dripping, and agitate the solution while applying it. Wear gloves when preparing and using the treatment, spray it on a windless day and reapply it after rain. The foliage of sunflowers is known to cause a rash in some people. Wear gloves when handling parts of the plant to protect your skin.